Eric, I don't watch much/any NHL during regular season, but once the Caps are in the playoffs, I've got to watch. More intensity, and impressive watching the goalies make tough stop after tough stop. We're just not going to see eye to eye on this one. I love that I have a fabulous memory and can tell you most every phone number in my phone without looking and I HATE hockey. Good morning Eric - thank goodness memory is overrated because mine is starting to go :) Have a great day! I completely agree with this one. My memory is not there with phone numbers, etc. I often use the GPS to get me where I need to go, even though I know the mean streets of Fort Wayne like the back of my hand. Playoff hockey is exciting!! Fun to watch. BLiz, I watch a few games during the regular season if nothing much is going on, but I'd watch every playoff game if I could. Judi, I don't go to many sporting events in person. I'd rather have the comforts of home, including a stocked refrigerator and a clean bathroom close by. Tammy, that's what I hope these Overrated/Underrated posts do. Just start a discussion. There's no right or wrong. Jean, haha. Eat more fish or fish oil supplements. Jared, it's about time you agreed with me lol. I didn't know Fort Wayne had mean streets. Anything like Livonia's? Michael, that's kind of what I meant. We don't need to rely on the memory for the little, mundane things. 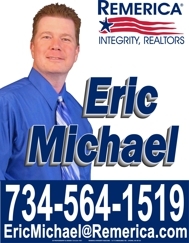 Post © 2019 Eric Michael, Metro Detroit Real Estate Professional 734.564.1519 (Remerica Integrity, Realtors®, Northville, MI). Design © 2019 ActiveRain, Inc. All rights reserved, Inc.